Friday Chris and I partied like it was 1999. (At least I thought it was a good time anyways. . .) We went to the Phoenix Art Walk. There was incense in the air, emo's, hippies and best of all, ART. It reminded me how we all have different interpretations of what art is. Saturday we had an impromptu garage sale. Our hood was having one so Chris woke up early and thought, what the heck, let's sell some stuff! Most people's garage sales get pretty sparse as the hours go by, but we just kept throwing more and more junk out as time past. I was too shy for the garage sale masses, so Chris wheeled and dealed with everyone. He had a story for every item out there. In the end we made over a hundee. Woot! Woot! So are the dolla bills for Fabio's waistline? You are so good, I never made money at a yard sales. You guys are funny. 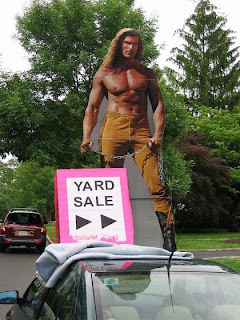 I love that you did a yardsale last minute. And not to be mean, but what's the story with the ugly dog?.. (I'm sorry, but I think I saw that you even called her ugly.) Did you rescue her or something? I'm really not trying to be mean I promise.